Warm air systems distribute heated air through duct work systems of supply and return air through metal or fiberglass ducts. 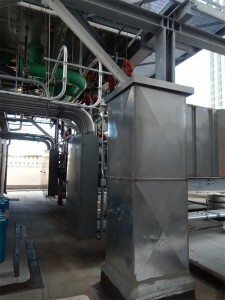 Many systems use the same ducts to distribute air cooled by an evaporator coil for air conditioning. The air supply is typically filtered through air cleaners to remove dust and pollen particles. One type of heat source is electricity, typically heating ribbons made of high resistance wire. This principle is also used for baseboard heaters, and portable heaters. Electrical heaters are often used as backup or supplemental heat for heat pump (or reverse heating) systems. The use of furnaces, space heaters and boilers as means of indoor heating may result in incomplete combustion and the emission of carbon monoxide, nitrogen oxides, formaldehyde, volatile organic compounds, and other combustion byproducts. Incomplete combustion occurs when there is insufficient oxygen; the inputs are fuels containing various contaminants and the outputs are harmful byproducts, most dangerously carbon monoxide which is a tasteless and odorless gas with serious adverse health effects. Without proper ventilation, carbon monoxide can be lethal at concentrations of 1000 ppm (0.1%). However, at several hundred ppm, carbon monoxide exposure induces headaches, fatigue, nausea, and vomiting. Carbon monoxide binds with hemoglobin in the blood, forming carboxyhemoglobin, reducing the blood’s ability to transport oxygen. The primary health concerns associated with carbon monoxide exposure are its cardiovascular and neurobehavioral effects. Carbon monoxide can cause atherosclerosis; the hardening of arteries, and can also trigger heart attacks. Neurologically, carbon monoxide exposure reduces hand to eye coordination, vigilance, and continuous performance. It can also affect time discrimination.